1. Preheat the oven to 180°C, gas mark 4. Line a muffin tray with 12 cupcake cases. Rinse the grated courgette in cold water, then dry well in kitchen paper, set aside. 2. Using an electric whisk, beat the eggs, sugar and salt in a large bowl for 3 minutes until pale and thick. Fold in all the remaining cupcake ingredients (bar the courgette) until well combined, then fold in the courgette. Divide the mixture between the cupcake case. Bake for 20 minutes until cooked through, then cool on a wire rack. 3. For the icing, melt the white chocolate in a bowl over a pan of boiling water; stir in the honey in another bowl, mix the icing sugar with 5 tsp boiling water until smooth, then stir in the melted chocolate with a wooden spoon. Leave to cool. 4. 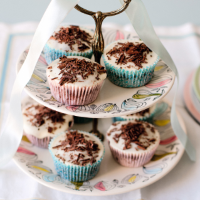 Place a heaped teaspoon of icing onto each cupcake, smoothing the top with the back of the spoon. Cool for 10 minutes before sprinkling over the grated chocolate.